Welcome back, everyone! Thanks for once more dropping by our comic review pages; we love to see you here! So we have some exciting news in the world of my health. As you may know, if you have been following our blogs for any time, I am facing cancer for the second time. Well, it seems my medicine has been doing its work. We came back from the doctors on Thursday last week finding out that my main tumor has shrunk by basically a third of its size one way and almost half its size in the other! So good news all around but things have been busy with us health wise due to meds and such taking a toll. Add into this the stress of an upcoming hearing to determine whether I get disability or not and you can see why things have been kinda quiet lately. I do apologize about that. So our second review blog of this week will come to you from the same as the last one the awesome people at Vibranium Comics and Games in Ocala, Florida. You can give them some love by checking out their facebook page by clicking the banner below. They are always doing some sort of event or something fun in the shop so check them out and look at their events page! 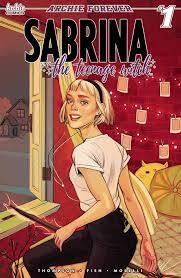 Our new review is for Sabrina the Teenage Witch #1. This comic was pretty good overall as it was a new beginning to the Sabrina mythos. I used to watch the show back in the day and I also used to read the old comics in the Archie Digest books and had enjoyed them. This, however, was a far cry from either of those and yet, for me, it still really worked. The beginning of the comic saw an injured Sabrina being attacked by a monster and then it flashed back to how the day started. Sabrina was getting ready to start school in a new town. She was swearing off of magic so that things wouldn’t go wrong in this new town. Her aunts saw her off to school where she meets Harvey, another handsome guy, the handsome guys bully of a sister, and the nerdy outcast that gets bullied by the aforementioned bully. Sabrina befriends the nerd and flirts with the handsome guy kinda while also liking that Harvey seemed to be taken with her as he helped her find her first class and pick up after the bully girl made her drop her books and such. Though at the beginning of the day it was revealed that they were trying not to do magic all through this book Sabrina was doing small little spells. She changed her hair color, used her magic to kinda flirt with the handsome boy in a way he wouldn’t know about, and made the bully trip into some mud. She kept making small little spells just in her first day at the new school. The problem is the more you use something like magic the more there’s a chance of something going wrong, which brings us back to the start of the comic except now we see the beginning of the attack by the creature and we find out what it is and get an idea of where it came from. Have you been enjoying the new Sabrina show? Did you ever watch the old one? Would either of those make you want to check out this new comic? Personally, I enjoyed this new comic though I still have to watch the new show. Sound off below and let us know what you think of all of this! Remember as always, if you enjoy what we’re doing here and want to help support us then drop by Ko-fi.com/thalra and drop us a tip. Everything we make from your generous tips will go to making this site better and better and bring you more reviews of different things!